Your child can write a short story about the family dog (or make one up) while perfecting his penmanship! Everyone loves to talk about their dogs; give your 1st grader a head start. What is this silly dog doing up in outer space? Challenge your child to write a story to go along with the picture in this coloring page! If your family owns a cat, this is a perfect time to make the furry family member the star while your child practices penmanship (without even knowing it). How does this story start and end? Let's draw the story to practice storytelling and comprehension skills! 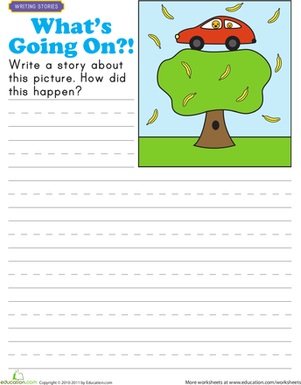 This worksheet asks first graders to read, write and draw all about summer! What would you say to a dog if that dog could talk? PBS KIDS' Martha Speaks can do just that, and you can writer her a letter! 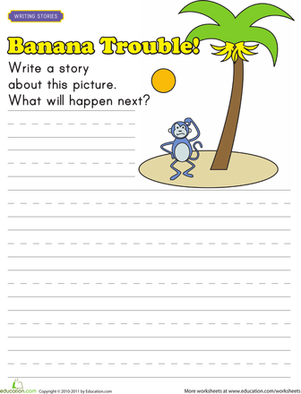 This cute worksheet asks your first grader to write a silly story about how this hungry monkey captures those yummy bananas. Story Starters: What's Going On? 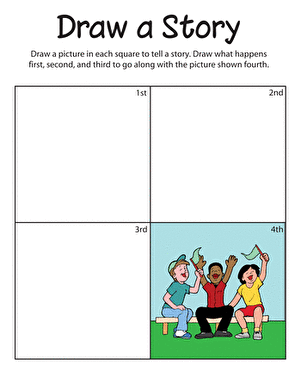 This laugh-out-loud worksheet is sure to inspire your first grader to write a silly story.